As we have seen in previous chapters, Ithkuil, like most languages, employs affixes (including both prefixes, suffixes, and infixes) in its morphology. However, one type of affix to the formative, the Vx+C suffix from Slot XI, operates in a manner warranting separate analysis. This chapter describes the morpho-phonological structure of these Vx+C suffixes (how they are formed from consonants and vowels), as well as their function. 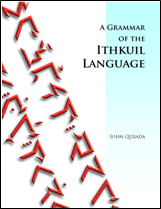 All Ithkuil affixes we have analyzed up to this point, whether prefixes or infixes, have consisted of either a single vocalic form (i.e., a single vowel, a diphthong, or a dyssyllabic vocalic conjunct), or a single consonantal form (i.e., a single consonant, a geminated consonant, or a consonant cluster), each of which has been invariable in its form. Furthermore, we have found that only one such affix can occupy its given slot in the formative’s structure. However, the VxC suffix from Slot XI is different in three respects: (1) it is comprised of both a vowel form and a consonantal form, (2) the vocalic portion of the suffix can mutate, and (3) more than one VxC suffix can occupy Slot XI in the formative (i.e., VxC suffixes can be strung together sequentially one after the other). While the consonantal portion of the suffix, C, is always invariable, the vocalic portion Vx mutates depending on two morphological factors known as degree and suffix-type. The nine different degrees will be discussed in detail in the next section below. As for suffix-type, every consonantal-based Vx+C suffix falls into one of three types, which determine what vowel or vowels will come before the invariable consonant C. The three suffix-types are labelled V1, V2, and V3, in reference to the vowel portion of the suffix. In addition to the three suffix-types, the vowel(s) associated with suffixes are also determined by degree. There are nine degrees, each of which has three associated vowel infixes corresponding to the three suffix-types. Table 24 below shows the vowel(s) associated with each suffix-type. As for the morpho-syntactic function of Degree, it is used in Ithkuil to create a gradient system for all consonantal suffixes, which generally indicates the degree to which the semantic concept underlying the particular suffix applies to the particular stem. This gradient usually extends from zero-degree (i.e., the particular concept or quality is absent or minimal) to a maximal degree (i.e., the particular concept or quality is present in totality). We will see in the tables of suffixes in Section 7.4 how this gradient system is used systematically in many dynamic semantic contexts. As a preview we can illustrate the meanings associated with the nine degrees for the suffix -V1d. There are approximatey 200 different consonantal suffix categories, each of which divides into the nine degrees discussed above to render over 1800 distinct suffixes. Each degree of a suffix has a distinct meaning, often representing a point along a continuum in terms of how much or how little the underlying semantic sense of the suffix category is being manifested by the particular formative. It is important to remember that, since all morpho-semantic stems are both nominal and verbal in meaning, all suffixes to a stem have both a nominal and a verbal meaning. Therefore, the choice whether to translate the suffixes below into their nominal or verbal meaning is entirely dependent on the morpho-syntactical structure of the word within the context of its use in a phrase or sentence as a whole. For convenience’ sake, when referring to a particular suffix of specific type and degree, we will use the notation in the section above, utilizing a V for the variable vocalic component, a subscript 1, 2, or 3 indicating the suffix-type, followed by a slash and a number indicating the degree. Thus, the suffix -nt of Type 1 and 4th degree will be written -V1nt/4, while the suffix -r of Type 3 and 8th degree will be written -V3r/8, and so forth. Each suffix category comes in three types, numbered 1, 2, and 3, indicated by variances in the initial vocalic component of the suffix. Use of the Type 1 version of a suffix caries a mere circumstantial meaning applicable to the context at hand in a subjectively incidental, happenstance, temporary, or informal manner, whereas the Type 2 version of a suffix implies a derivational meaning which can entail lexical differences when translating into English. For example, the Type 1 suffix -up, i.e., -V1p/9, and its Type 2 counterpart -uip , i.e., -V2p/9, which both mean ‘exactly similar to…/identical…,’ the difference in usage being that the Type 1 suffix conveys merely a circumstantial or incidental similarity, while the Type 2 suffix implies that the similarity is an integral aspect of the word. In English, such a distinction would most likely be conveyed by using a different word. For example, note the difference when we add these two suffixes to the Ithkuil word eqal ‘person’: eqalup means ‘identical-looking person,’ whereas eqaluip means ‘twin.’ In this way, we can say that the suffix -Vp with Type 1 vocalic infixes conveys a circumstantial application of its meaning to a stem, while with Type 2 vocalic infixes, it conveys a derivational application of its meaning (i.e., wholly new concepts or words are derived from the stem). When adding two or more suffixes to a stem, the suffixes generally can be added to the stem in any order desired, with the exception of V3C suffixes which modify an adjacent suffix. This latter type must precede the suffix it modifies, unless there are only two VxC suffixes to the word, in which case the order is irrelevant. Note that when a Type 3 suffix appears alone in Slot XI, unaccompanied by another VxC suffix, it serves a different purpose than normal. Such lone Type 3 suffixes are used as “short-cut” ways of displaying a type of adunct we will discuss in Chapter 8, called a personal reference adjunct. In these cases, the consonant portion of the suffix, rather than repesenting its usual suffix category, instead corresponds to one of the numerous personal reference categories we will discuss in Chapter 8, while the vowel portion of the suffix, rather than corresponding to one of nine degrees, instead correponds to one of nine noun cases. The details for utilizing these special V3C suffixes are discussed in Section 8.1.5. The 200 suffix categories are listed in the sections which follow, indicating the difference in meaning for each of the nine degrees. Recall that each of these suffixes may (theoretically) function as both Type 1 and Type 2 suffixes, the latter type often entailing a change of meaning or lexical shift when translating into English. These suffixes correspond to various determiners and modifying adjectives in English having to do with denoting or identifying a noun within a larger context or discourse. Deictic suffixes refer to the grammatical process of deixis, the act of pointing to or pointing out. The suffixes correspond to the different variants of the concepts of ‘here’ and ‘there.’ In Ithkuil, distinctions are made in these suffixes as to whether a referent is near the speaker, near the listener, distant from both, whether it is observable or accessible, and in some case, whether it is alienable or inalienable (i.e., whether the entity can be separated from the associated person). Degree 2 for a "minute"
Note: the CAL suffix inherently conveys Functional (FNC) Context, since calendrical notions are, of course, societal conventions as opposed to being natural ontological concepts. Therefore, for formatives carrying the CAL suffix it is not necessary to inflect for FNC Context. Degree 9 total, -ful; to greatest extent / maximum / maximal; maximally / at full capacity, e.g., She bought out the store. This suffix is used with all vector-like or gradient concepts. When used with the COMPLETIVE version, degrees 1 and 9 imply attainment of a change in state, e.g., sleepiness → sleep. Used with the following degrees, the above five suffixes operate to expand Phase into showing increases or decreases (or wavering) of intensity of an action during its duration. This suffix, for example, would be used to distinguish the names of the various ranks within a military or paramilitary organization such as private, corporal, sergeant, lieutenant, etc. all the way up to general and supreme commander. The above four suffixes are used to affirm or negate a formative. Because much of the information associated with an Ithkuil formative is carried in adjuncts, the above suffixes are used to indicate exactly which morpho-semantic information is being affirmed or negated. For example, in English the sentences I don’t want to stop eating, I want to not stop eating, and I want to stop not eating mean different things. The above four suffixes are used with the following degrees. This suffix and the following identify a formative as filling a specific semantic role corresponding in many cases to the semantic roles discussed in Sections 4.1.1 and 4.1.2. In several instances, these suffixes would translate the English “agentive” suffixes -er, or -or. Degree 3 [RECIPIENT] = one who receives / has / "-ee"
The various functions of the above suffix are explained in Sec. 5.4 on Frames, and Sec. 9.1 on Topic and Focus. Metonymy is the reference to an entity via one of its attributes, associations or activities, as in The ham-and-cheese wants fries with his order or The White House has its nose in our business. This suffix is used to distinguish particular instantiations of a more generic entity; their meaning is semantically specific to the particular stem. The above affix distinguishes movement of an entity from the “trail” or spread left behind, e.g., movement which leaves behind a wake or affected area; used with motion roots as well as roots designating shapes/forms. Use of the above suffixes in conjunction with the various roots pertaining to paths of translative movement allows for very nuanced translations of English words such as surround, cover, inundate, enclose, expand, spread out, encompass, etc. The above affix is used with the number stems (see Chapter 12) to provide words for forms, shapes, and solids bearing a distinct number of angles, points, sides, facets, etc. Alternate forms of Comparison Operators ( Levels) (see Section 6.2.3) - V1C forms correspond to relative comparison, V2C forms to absolute comparison. Inability/Incapacity Due To . . .
Twelve consonant forms are used for these Slot XI suffixes, which combine with the three suffix-types to give the 36 forms necessary to specify the nine possible configurations and four possible perspectives of the incorporated stem. In turn, the nine suffix-degrees times eight vocalic Vf suffixes in Slot XII combine to identify which of the 72 primary noun cases constitutes the Format of the incorporated stem. All these forms are shown in the matrices below. ©2007-2011 by John Quijada. You may copy or excerpt any portion of the contents of this website for private, individual, or personal use which is non-commercial in nature and not for purposes of profit. Otherwise, you may copy or excerpt brief portions of the contents of this website in published, web-accessible, or commercially distributed articles, papers or webpages for purposes of review, commentary or analysis, provided you give full attribution to the author and this website.